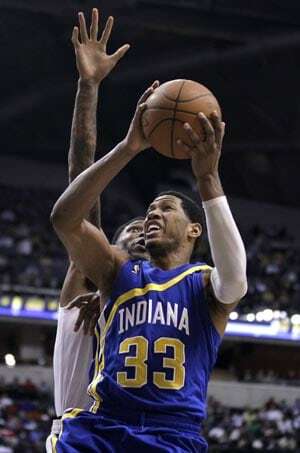 Danny Granger scored 25 points to help the Indiana Pacers beat the Miami Heat 105-90 on Monday. Darren Collison added 20 points, and Paul George had 16 points and 10 rebounds for the Pacers, who have won four of five and finally got the signature win they have sought since the All-Star break. LeBron James had 24 points and nine rebounds, and Dwyane Wade had 24 points and six assists for Miami. The Heat, coming off a 103-87 loss at Oklahoma City on Sunday night, lost by double digits in back-to-back games for the first time this season. Miami (35-13) lost for the fourth time in eight games overall and is running out of time to catch Chicago (40-10) for the best record in the Eastern Conference. The Heat had won the previous three meetings this season, but the Pacers played with confidence throughout. Indiana led by double digits for most of the fourth quarter, and Pacers fans stood and showed their appreciation during the final minute. The Pacers closed the first half out in style. First, Indiana center Roy Hibbert dunked on James with a minute left in the half, then George hit a half-court shot at the buzzer to give the Pacers a 49-46 lead at the break. James had 16 points and six rebounds in the first half, but his teammates struggled. A two-handed breakaway jam by Collison early in the third pushed Indiana's lead to 53-46 and forced Miami to call a timeout. George hit a 3-pointer to push the lead to double digits for the first time. The Pacers held Miami scoreless for the first 3 minutes of the second half. James scored and was fouled, missed the free throw, tracked down the rebound and made a jumper to cut Indiana's lead to 59-55. Wade followed with a 3-pointer, and suddenly, Indiana's 10-point lead was down to one. But the Pacers responded quickly. Hibbert stuffed James, and Granger hit a jumper at the other end to give Indiana a 67-60 lead and force another Miami timeout. Granger's 3-pointer gave Indiana a 71-60 lead. The Pacers held Miami to 6-for-19 shooting in the third quarter to lead 78-65 at the end of the period. James rested at the start of the fourth quarter, leaving Wade and Chris Bosh to try to close the gap. But two 3s by Indiana's Leandro Barbosa early in the period helped the Pacers maintain some distance. A three-point play by Barbosa gave the Pacers an 87-73 edge. Barbosa scored nine points in 98 seconds and forced the Heat to put James back into the game. Indiana remained comfortably ahead the rest of the way. Granger was fouled on a 3-point attempt and made all three free throws to push Indiana's lead to 99-87 with 4:30 to play.